Moving Planet Seattle is Seattle's instance of a global 350.org event, a day to put our demands for climate action into motion — marching, biking, skating —calling for the world to go beyond fossil fuels. Ride with Bike Works! There will be a community bike ride leaving from Bike Works (3709 S Ferdinand St) at 10:30 on Saturday, September 24th and traveling all the way down to South Lake Union Park to join in the big ol' party. 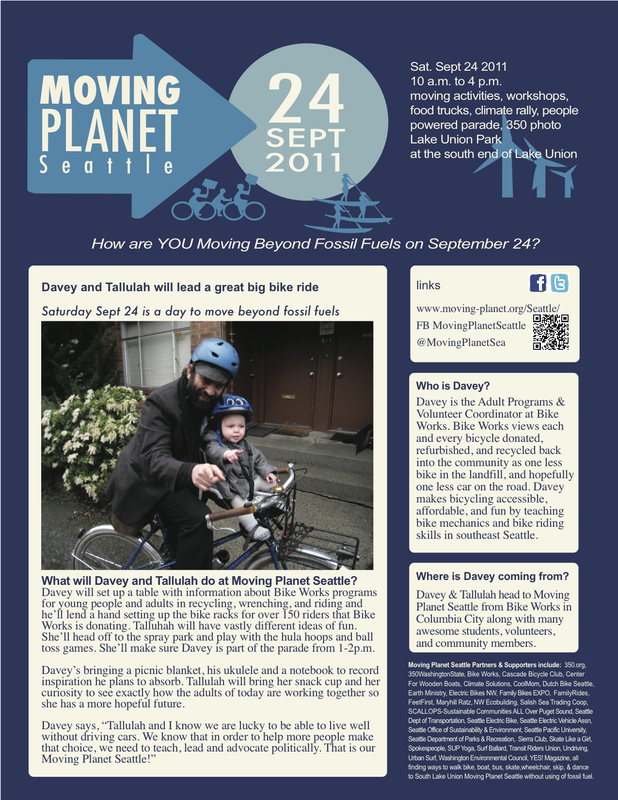 We will join with other Moving Planet ride groups along the way. It should be a blast! what: Bike rides, walks and skate parades from all around the city, workshops, info tables, activities, games, demos, a big fun festival and a rally in support of climate action! Its going to be a great day! Ride with Bike Works! There will be a community bike ride leaving from Bike Works at 10:30 on Saturday, September 24th and traveling all the way down to South Lake Union Park to join in the big ol' party. We will join with other Moving Planet ride groups along the way. It should be a blast! RSVP to Davey if you are interested in coming, and tell your friends!